Macaroons are probably one of the easiest cookies that you can make. Mine are made with just egg whites, sugar and shredded coconut, with a little bit of vanilla extract (or some other flavoring) thrown in for good measure. I’ll make them just about any time that I have an unused bag of coconut lying around, and I’ll also make them when I need an easy to make dessert for get-togethers.Â The cookies are sweet enough to be satisfying and have a great coconut flavor to them. One trick I use to get a good consistency to my macaroons is to run a chefs knife through the shredded coconut before I use it. 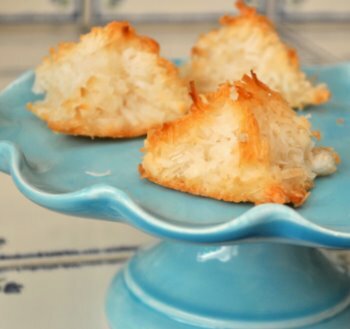 This breaks up some of the long strands of coconut and ensures that you get a macaroon that doesn’t fall apart when you bite into it. You can really finely chop the coconut, too, but I prefer to keep some of the texture of the shredded coconut and go for more of a rough chop. The cookies can be shaped into round balls before baking, or patted into different shapes (I am a fan of little pyramids) before baking. Macaroons are good plain, but you can easily dress them up by dipping the cooled cookies into some melted chocolate – dark, milk and white chocolate are all good choices – and placing them on a sheet of wax paper to firm up before serving. These are very good when they are fresh, but keep extremely well in an airtight container and become even more moist and chewy after a day or two. Spread your shredded coconut on a cutting board and coarsely chop it with a knife to break up the larger shreds of coconut. In a medium bowl, whisk together egg whites, sugar and vanilla until well blended. Add in shredded coconut and stir with a spatula until well moistened. Bake for about 20 minutes, until macaroons are golden brown around the edges (time will vary slightly by size of the cookies). Cool completely on a wire rack. 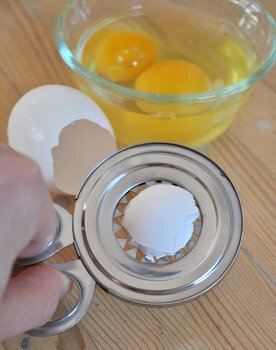 What is an egg topper? Previous PostPrevious What is an egg topper? Yum! We always dip ours in chocolate…..might need to make some soon! Also, love your cake stand. Yum! 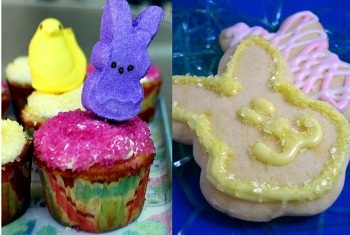 I made these tonight for a Passover dessert. So easy! My bag of coconut was only 2 2/3 cups so I reduced the sugar to 1/3 cup and they came out great. I like the trick of chopping up the coconut. I dipped the bottoms in melted semi-sweet chocolate and drizzled some on top too. Made these yesterday. So darn easy and I dipped the bottoms in chocolate, too. I’ll be making them again. Thanks. it looks so yum and easy to make. I wanted to try bu hv got a small oven, can i bake it in batches, do i need to store my prepared misture in freeze while my 1st bacth is baking? I followed this to a “T”, and they fell apart – not holding together when cooled after being baked. Hmm… ?? I’ve always made macaroons with egg white whipped to ‘peaks’ previously…maybe I’ll do that with the next batch instead of just whisking them together as this recipe suggests. Feedback? Does anyone know that the equivalent amount of ‘cups’ or similar for 2 large egg whites? I froze my eggs whites from when I made a key lime pie so it’s difficult to split them out again without knowing an equivalent measure. How are your pyramids so perfect?! GREAT recipe! Mine are baking in the oven as we speak. 🙂 YUM. Thanks soooooooooooooooo much!!!!! These macaroons are tastier than any I’ve ever made, and that’s saying a lot, because I am a recipe poster on Allrecipes! Anyway, just so you know, Becky – even though it’s been a year since you posted this comment, one egg yolk is he equivalent of a tablespoon, and the amount of egg whites in one egg is two tablespoons. Hope I could help (even if it’s just a tad, or even not at all, hopefully it will be useful to someone else, too)!!!!! GREAT RECIPE!!!!!!!!!!!!!!!!!!!!!!!! I still have 2 egg yolks left – PERFECT!!!! Baking macaroons as we speak, Happy Spring everybody! I accidentally made these with only 2 cups of coconut instead of 3, and they came out like crispy cookies with a chewy center. They were delicious….let’s hear it for serendipity!